I have just recently visited Islay for the very first time. Wow, I am impressed, really! I want to go back! The island was much bigger than I anticipated. 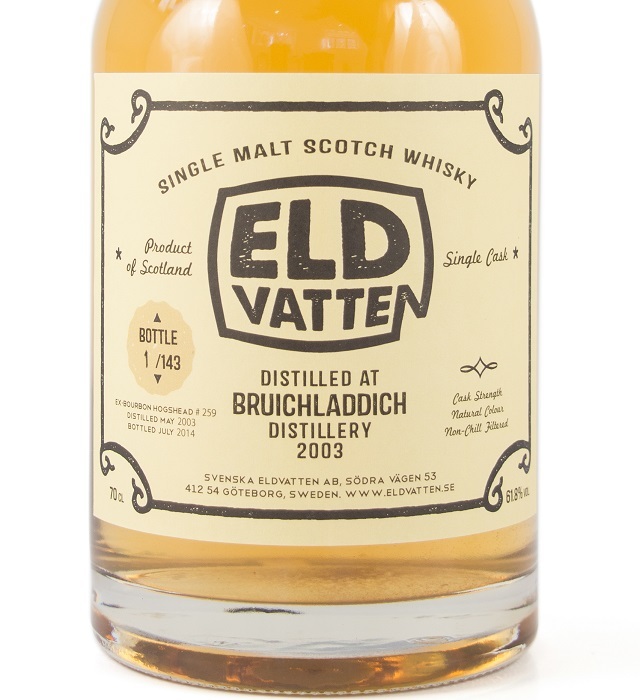 The Swedish independent bottler Svenska Eldvatten took us to almost every distillery at Islay. Lovely! At Bruichladdich we had a warehouse tasting. So, as you probably already understand I did not taste this whisky at the distillery. This is a bottling from Svenska Eldvatten. The whisky was distilled in May 2003 and bottled in July 2014 which makes it 11 YO. It was matured in ex-bourbon hogshead #259 and the outturn was 143 bottles. The whisky is unfortunately not available to buy in Norway or Sweden. Nose (23/25): Sour sweetness and saltiness. Sounds great, does it not? This is driftwood on the beach. Vanilla. Light, sort of fresh, sawdust. Fudge. Rich. Hint of dust. It really is good! Taste (22/25): A warm and rich mouthfeel. A simple mix of salt and sweetness. Fudge og caramel. Finish (22/25): A warm and long finish. Some oak. Burnt caramel and the sweetness from Coca Cola. Balance (23/25): A very rich whisky. Not complex, but clean. Lovely! It does not do a lot, but what it does it does really well.